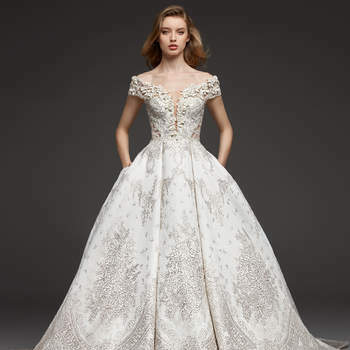 Although bridal designers are continually innovating with style, cuts, details and materials, we have seen that wedding dresses for 2019 are taking on a somewhat classic element – with crystals, jewels and embroidered stones coming right back into fashion! In this gallery, we’re going to show you a vast selection of wedding dresses with crystals, so you can look truly glam on your big day! Amongst the gowns that we have on show here, there are different styles from the international brands, such as the new 2019 Pronovias Collection, which is a mix of vintage gowns with modern decorations. Crystals and gems are one such vintage feature, which always add a chic and elegant touch when applied with skill – for this reason, we would recommend that you wear them for afternoon or evening weddings, which are more formal (as opposed to an outdoors ceremony!). But if you don’t want to sacrifice this glamour for your outside wedding, you can check out wedding dresses which have crystal belts, for just a hint of class and elegance. Different dresses with similar styles and one characteristic in common: the brilliance and glamour that crystals and gems bring! 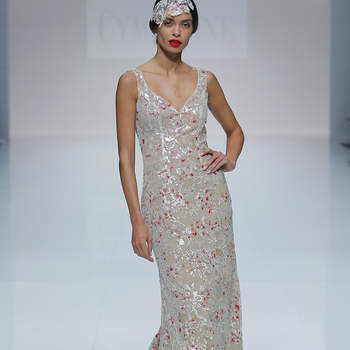 Don’t miss out on having a dress with crystals for your wedding day – you will look completely radiant!